Sgurr a' Mhadaidh is a craggy peak on the Black Cuillin Ridge that can be climbed together with Sgurr a' Ghreadaidh. 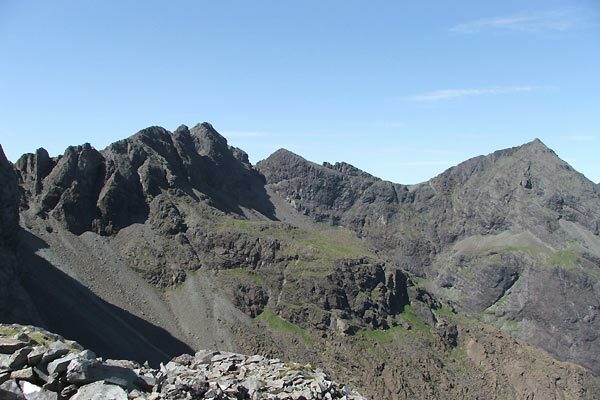 The Cuillin are composed of gabbro rock which gives wonderful grip even when wet, but these mountains have steep faces and narrow ridges which invariably require scrambling or even rock-climbing to reach the summit. The ascent starts in Coire a' Ghreadaidh on grass leading to scree slopes which should be ascended to reach the col, An Dorus (the door), between the two peaks. From An Dorus ascend to the crest of the ridge and traverse to the base of a buttress where a testing scramble with considerable exposure leads to easier slopes to the summit. In Coire an Dorus, approaching Sgurr a' Mhadaidh. The normal ascent is up the gully to An Dorus (middle of picture); but alternatively the screes left can be climbed to gain the col with Sgurr Thuilm and ascend by the NW ridge (grade 3 scramble). On the narrow ridge between Sgurr Thuilm and Sgurr a Mhadaidh. The summary information of one or more ascent routes that include Sgurr a' Mhadaidh. 1 1050 m 9.18 km 4 hrs Sgurr a' Ghreadaidh and Sgurr a' Mhadaidh This is one of the easier routes on the Cuillin Ridge, with its "sticky" Gabro rock. 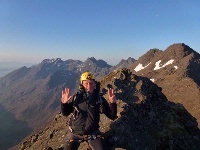 However, the Cuillin as a whole should not be attempted unless you have scrambling skills and are comfortable with exposure (see image gallery for further details). And its No 8 of my Traverse on the 28-29th May 2013 at 615 am !!! 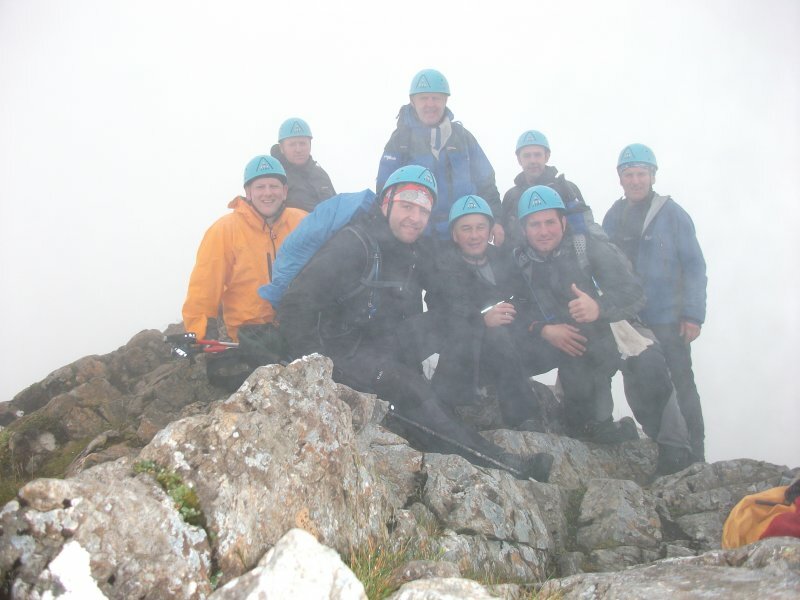 Neil on the left with me on my 200th Munro, 29.5.10. 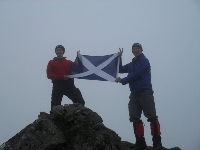 Post a few words about Sgurr a' Mhadaidh or read what others have had to say. 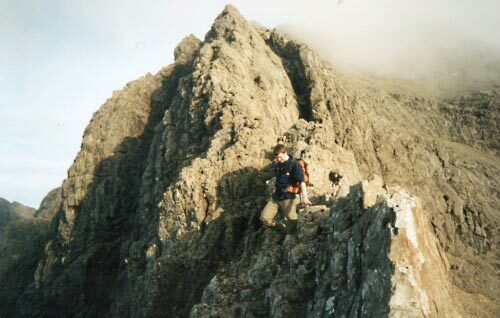 This Cuillin peak is very easily climbed using An Dorus. Parking is available at the Youth Hostel at which a good path leads into Coire a' Greadaidh. 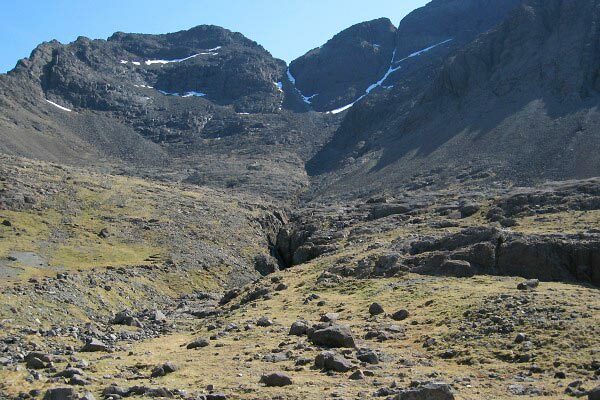 In the NE corner is Coire an Dorus where a good scree gully can be used to reach 'the door'. At the top of this narrow gap awkward grade 3 scrambling is required for the first few metres on polished rock before the last climb on rocky ledges leads to the summit. Just before the summit an airy cracked ledge must be crossed which adds to the enjoyment.